(UPM, Helsinki, 29 June 2017 at 14:00 EET) - UPM celebrates a digital milestone in 2017 with the launch of its new eOrder service, a groundbreaking online tool enabling speedy, transparent 24/7 order fulfilment through an intuitive, hassle-free digital interface. The pioneering eOrder tool forms part of UPM's existing Customer Online (COL) portal, which already offers paper customers a variety of convenient services such as real-time order status tracking, access to account history, invoicing and inventories, product browsing, e-claims and sample requests. With eOrder, real-time service now extends to the actual ordering process. The customer simply logs in, selects the product, the desired quantity and delivery date. The order is then submitted and processed automatically. The process is intuitive and easy to master, enabling customers to order paper online anytime and anywhere: their delivery is now literally only a few clicks away. The new tool marks a radical enhancement of the Customer Online (COL) portal as it takes UPM's digital services a significant step beyond just information-sharing. "The eOrder tool is more than just a convenient order channel. It is automatically aligned with our business processes and IT infrastructure, so we can give speedy confirmation of our delivery capabilities. 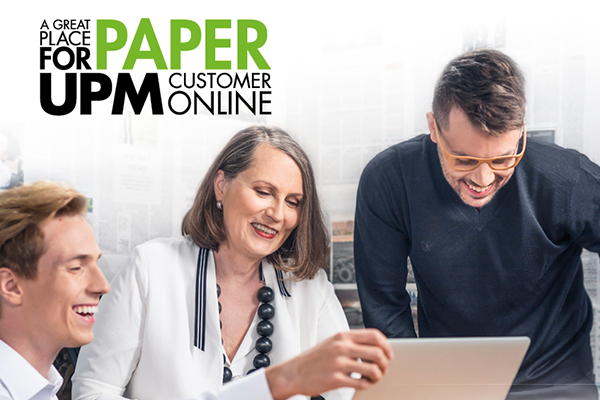 We can guarantee our promise to the customer from the very moment the order is placed," explains Mark Hatfield, Director of E-Business at UPM Paper ENA. The official external rollout of eOrder began at the start of 2017 following a series of customer trials and fine-tuning last year. "External implementation will be expanded in years to come based on our experiences this year," reveals Hatfield. The initial feedback from customers has been encouraging. "If you can use Amazon, you know how to place an order with eOrder, it's not more difficult. And you can see the delivery date right away; you don't have to wait for a confirmation," states Bastian Steinmetz from Steinmetz Briefumschläge in Schenefeld, Germany. The new eOrder service marks a natural continuation of UPM's benchmark-setting work as a digital pioneer. The palette of online services offered by UPM is unmatched by any other operator in the paper sector. Although UPM will continue working to offer speedy, convenient online services - with a future focus on mobile apps - Hatfield hastens to add that personalized service will always remain part of the portfolio. "We've always wanted to build alternative channels for our customers to work with us, but this doesn't mean that digital platforms will ever replace traditional face-to-face services," he concludes.